Sammi is a child on the run. One minute, she’s with her father, trying to accept the truth of her mother’s death. The next, she’s struck by lightning, not once, but twice, and in the aftermath, is swept up by Old Itch, a man not really a man, promising he’ll take her to her mother. Only partly willing, Sammi goes with him and on the way meets others twice-struck. All have patterns on their skins where the lightning hit, like a tattoo, or a roadmap. It marks magical being who’ve denied their heritage, “a network of fine trails, like a river delta seen from orbit, or the fine tendrils of a feather,” and it’s guiding them to their destination. Sammi doesn’t know it, but she and the others are being followed by several people with different motives concerning their welfare, but with only one overall goal in mind. One is Gregor, a Kin-Killer, hunting supernatural folk and collecting souvenirs from his kills. With these relics, Gregor’s goal is to become one of the Kin. Another is Mallian, seeking the fairy they call Grace because she has no real name, “lost in the midst of time, erased by failure,” a being once captured, now escaped to America. Mallian is a Nephilim, child of a fallen angel, one of the few born before humans and magic drifted apart and still sane enough to tell of it, how “their kind walked the wild unmolested and free, living their own peculiar lives, carving myths across the bare canvas of time and establishing their legendary paths.” He sees “each Kin as precious, and a killer scything his way through their ranks is reason to take action.” He also has an agenda of his own where Grace is concerned. Mallian wants Ascent, revealing himself and all the Kin, those believed myth, once more to the human world, but “you can’t throw magic and myth into the world without expecting chaos.” Capturing the Fold would assure Mallian’s success. Also on the hunt is Angela Gough, wanted by New York police after her escape from jail and now reunited with her lover, Vince, a man sworn to protect the Kin. With them are Lilou, a nymph, and Fat Frederick Meloy, British gangster and Vince’s employer, once a collector of magical relics, now their staunchest protector. There’s also Grace herself, gathering Kin around her, promising to take them to the Fold, a land existing beyond, in, and out of human time where the supernatural can find protection and peace. With the aid of a sympathetic American, a centaur, a cyclops, and a mothman, Angela and her crew’s quest ends in a mountainous, wooded wilderness, bringing with it a revelation that humans may have always known but refused to admit: that humans and magical beings were once closer related than they knew, that each of us may carry within himself a spark of magic, and it only takes the proper combination of time, place, and elements to reveal it. Anyone having read Relics, first entry in this series, will eagerly jump at the chance to read this continuation. Once again united with Vince, Angela, and the others are on a single-minded mission, this time to save her niece, though in doing so, their plans also encompass thwarting Mallian from carrying through with his plans, as well as preventing Gregor from reaching his goal. Lebbon is an award-winning author, and this novel is another example of the reason why. He has created a world that is at the same time familiar and entirely unknown. 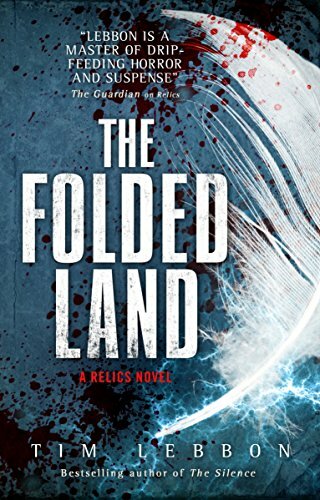 The Folded Land reveals a landscape in which both magical creatures and humans display their weaknesses and strengths, revealing why these two beings are equally fascinated by and distrustful of each other. It’s the same world in which we all live, but it’s also a place of wonder and horror, where one species fears discovery and the other fears belief. And that great schism may never be breeched without chaos ensuing. The ending is definitely a cliffhanger and its follow-up, The Edge, is on its way, eagerly awaited.